As Hillary Clinton widens her lead in the polls over Donald Trump, the Republican candidate's path to the White House is looking increasingly narrow. If he fails to win these six key battleground states, he will not be the next American president. This path to the White House assumes Trump carries all of the states that Mitt Romney won in 2012. That includes North Carolina, where he is currently projected to be narrowly behind Hillary Clinton. Two post-convention polls suggest the state is a close one. SurveyUSA found Trump up by four points among decided voters, while Public Policy Polling found Clinton up two points — with the trend line pointing in her direction. But North Carolina should be the easiest of the battleground states for Trump to carry. Apart from Barack Obama's victory there in 2008, the Republicans have won it in every election since 1980. Nevada is a state that is trending more towards Trump than other swing states. Obama won it by almost seven points in 2012. It is a tight contest, with a YouGov poll putting Clinton up by two points and a Rasmussen survey giving Clinton the edge by a single point among decided voters. Ohioans have voted for the winning presidential candidate in every election since 1964. That makes it an important bellwether state, and one that no Republican has ever been able to lose and still win the White House. There has been no post-convention polling in Ohio, though the last survey conducted in the state gave it to Trump by three points among decided voters. But this was at a time when Trump was trailing Clinton in the national polls by 1.8 points. Things have since swung towards Clinton by more than five points nationwide. State-by-state projections for the U.S. presidential election, including polls conducted up to Aug. 7, 2016. Barack Obama won Florida by just 0.9 points in 2012. Worth 29 electoral college votes, it is the most valuable swing state in this election. It is difficult to imagine a plausible path to victory for Trump without Florida. So it is a problem for Trump that Clinton has led in 11 of the last 15 polls conducted in the state, including a recent poll from Suffolk that gave her a four-point edge among decided voters. There has been no polling since the convention in Iowa, a state that Obama won by six points in 2012. On paper, it should be a difficult one for Trump to pluck from Clinton. With the exception of 2004, it has voted for the Democrats in every election since 1988. The last polls done in the state, before the conventions, pegged the gap between Clinton and Trump at two points or less. But even if Trump won all five of these battleground states, he would still be five electoral college votes short of 270. Pennsylvania would be the next state on Trump's list, as the Poll Tracker puts the margin between him and Clinton here at its smallest among the states that could put Trump over the top. Still, that margin currently stands at just under eight points. This is a state that Obama won by five points in 2012 and that has voted for the Democratic candidate in every election since 1992. Additionally, recent polls suggest it may be out of Trump's reach. While one poll, by Public Policy Polling, put Clinton's lead at just three points, other surveys conducted since the end of the conventions (by Suffolk, Franklin & Marshall College and Susquehanna) have put the margin at 10 to 15 points. These six states represent the path of least resistance for Donald Trump, but he does have some alternative routes. They are no easier, however. If Trump wins all the states carried by Romney in 2012, adding Florida, Ohio, and Virginia (the three states lost by Romney by the narrowest margins), that would still put him just short of the White House. He would then need to add Colorado, Pennsylvania, New Hampshire or Iowa to his tally. But the Poll Tracker currently puts Trump behind Clinton by over eight points in Virginia, Colorado and New Hampshire. A couple of recent polls out of Virginia and New Hampshire have suggested the gap is even larger (13 points in Virginia among decided voters, according to YouGov, and 16 points in New Hampshire, according to MassINC). Trailing Hillary Clinton by over six points nationwide is not a recipe for Donald Trump to become the next president of the United States. If he is to have a hope of winning, those national numbers need to improve. 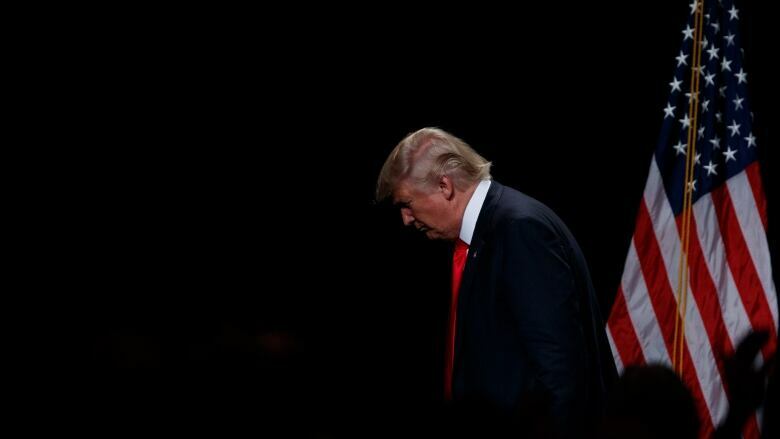 Nevertheless, if he closes the gap in a number of swing states, he has a chance of winning the election despite losing the national popular vote. George W. Bush managed that feat in 2000. 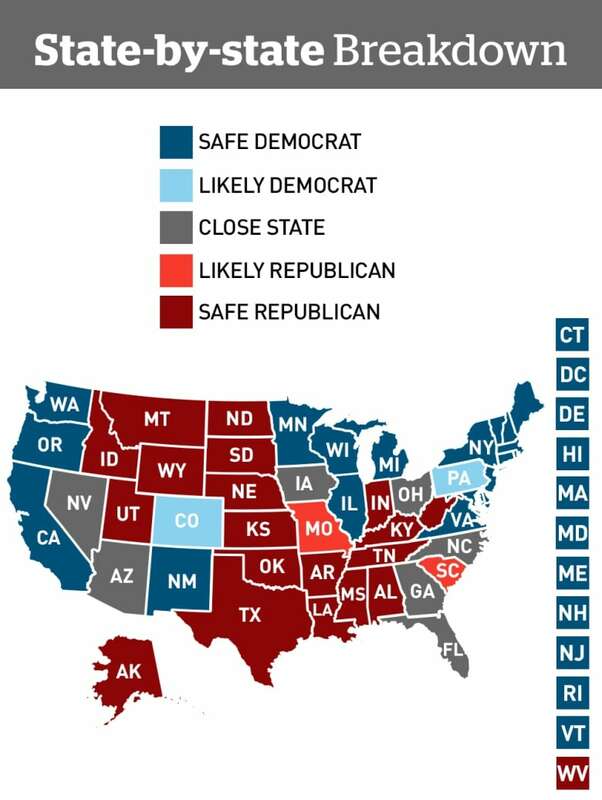 Based on recent polls in these swing states, however, those chances are looking increasingly slim. The Presidential Poll Tracker includes all published mainstream surveys, a list of which can be found here. The polls are weighted by sample size and date, as well as the reliability of each pollster as rated by FiveThirtyEight.com. The electoral college is projected by applying the same weighting standards to state-level polls and combining this with a uniform swing model, based on how the current national polling average compares with the 2012 presidential election. Surveys included in the model vary in terms of sample size and methodology and have not been individually verified by the CBC. A full methodological explanation can be found here.